Check out this great video! This might be the best coporate marketing video ever! We believe in passion more than pundits. We have more faith in fans than fancy talkers. And we'll take dudes over dilettantes any day of the week. Wild Cajuns calling LSU football games. Improv comedy troops providing coverage of Congressional hearings on CSPAN. Your grandmother commenting live on an episode of Naked & Afraid. We're all about bringing a fresh approach to live sports and television broadcasts by giving fans a voice and a community where they can share their insights and observations on what's happening in the world of live sports and television. Free from the restraint of network predictability, Rabblers are creating a fresh, new type of audio entertainment. Rabble is more than just a broadcast platform. We are a collective of entertainment fans participating in and voting on their favorite (or most hated) content -- and elevating the most interesting topics to the top in the process. Whether you’re looking for commentary on live sports, television shows, movies, or politics, Rabble is your home for alternative audio. 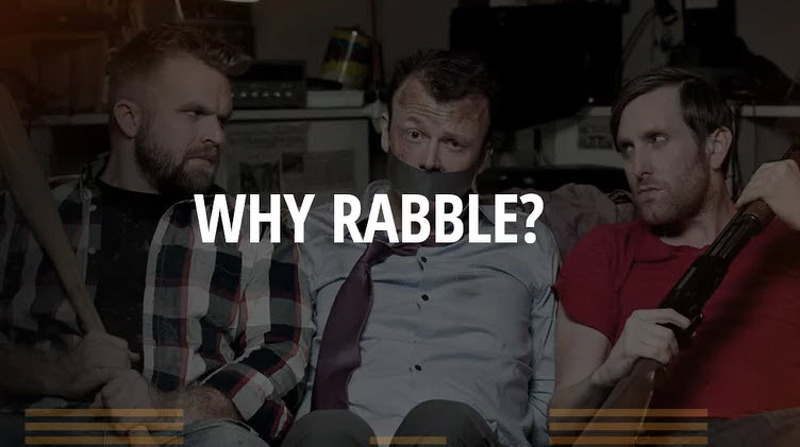 Rabble.TV is filled with user-created content on topics ranging from popular sports to obscure B movies. Through our website and apps, users can listen to live or archived audio streams tied to games, shows, and movies. Finding original Rabble audio content is as easy as clicking through the content channels of individual sports and television categories or using our search feature to find specific broadcasters, shows, teams or games. Whether you're listening from your computer, phone, or tablet you can interact live with Rabble broadcasters and other listeners via real-time message boards that accompany every broadcast. Rabblers have the power to influence the narrative through their direct interactions with other users covering live events. Know your team better than the bland network sportscasters? Tired of hearing national announcers get the facts wrong or hate on your team? It's time to do something about it. Mute your television, grab a microphone, and create your own Rabble broadcast.